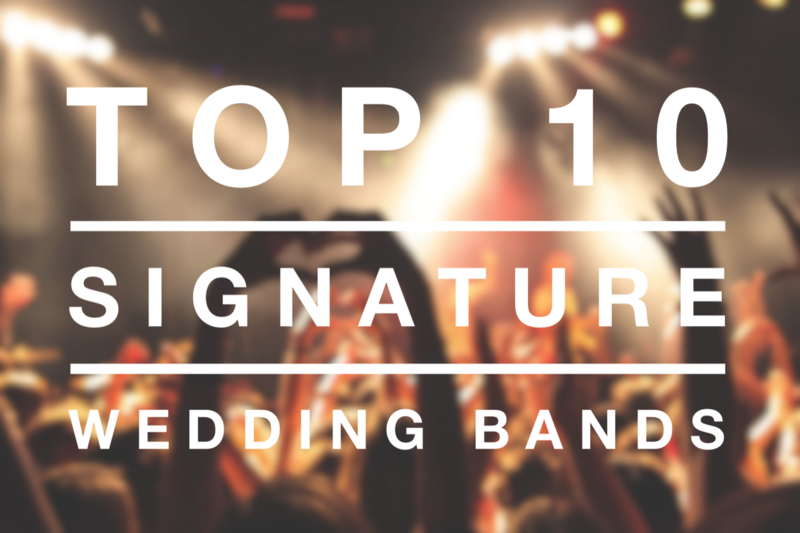 The Function Junction have tons of amazing live bands on its books, however we wanted to save you time by outlining our top 10 signature wedding bands to book for your special event, who are currently making waves on the wedding band scene this month. You won’t regret hiring Tommy T and the Belletones for your special day, as the nine-piece band (complete with horn section and 3 vocalists) deliver an incredible and fully choreographed 2 hour show. With a huge repertoire of songs spanning across most genres and decades from Motown, pop and rock, Tommy T and the Belletones are guaranteed to get your guests up and dancing whilst appealing to audiences of all ages. You’ll be in safe hands knowing that you have the best and most professional musicians playing for you on your wedding day, where Tommy T and the Belletones have worked alongside huge artists such as Amy Winehouse, Lady GAGA and Lionel Ritchie. The band also provide a full PA and lighting rig for their performance for maximum entertainment impact. Check out Tommy T and the Belletones performance video on their Function Junction band page. The 101’s have performed at many top function and wedding venues and have performed around the world and performed with The Feeling, Will Young and Sophie Ellis Bextor. The signature wedding band can provide background music or bespoke mixes pre-done by a professional DJ for an additional fee. They also have their own high quality PA and lighting system. Check out The 101's band page for more information. The Van Gough’s are like having real superstars play on your wedding day, with an ultra-slick performance, amazing vocal talents and a vast choice of floor-filler hits. The 5 piece band features male and female lead vocals as well as a guitarist, drummer and bassist. The musicians in The Van Gogh’s have top credentials having played with big names including Mariah Carey, Rhianna and Ed Sheeran - so you know your wedding entertainment calibre will be very high end! Check out The Van Gogh's band page and video performance for more information. "A massive thank you from Raff and I for making our wedding reception so enjoyable. You were all fantastic. So many of our guests complimented you on the night and are still complimenting you now. Kind regards Jackie and Raff." For the rock star brides and grooms out there, look no further than the Birmingham-based rock covers band The Radio Rock Stars. Also one of our lower priced option at the Function Junction, The Radio Rock Stars are an all-male 4 piece band who cover classic rock songs from Elvis Presley and The Beatles right through to the Foo Fighters, Coldplay, Feeder and Florence and the machine. The Radio Rock Stars play a 2 hour set or 3 x 40 minute sets, but can be flexible to suit your wedding day schedule. They have a professional PA and lighting system including dance floor lights, and provide a full DJ service at no extra charge. P.O.P. Inc are brilliant female-fronted live party band perfect for all your wedding day needs. They can supply music from the ceremony, drinks reception and wedding meal, playing laid back jazz, soul and acoustic pop covers as a duo and then transform into an energetic 4/5 piece band ready for your evening reception entertainment. POP Inc’s song list includes hits from the 1960’s to the present day, so all music tastes are catered for. P.O.P. Inc play two one-hour or three 40-minute sets. Full lights, PA system and recorded music during their breaks are all provided. Check out there live performance video on their band page. For a vintage-themed wedding or event, look no further than the amazing vocal harmony group Portobello, who specialise in putting their own swing and jazz twist on to modern pop songs (think Meghan Trainor, Rhianna and Sia), as well as covering old jazz classics too. The 3-6 piece London-based band are the perfect warm up act to entertain wedding guests during the drinks reception, wedding meal or evening reception, where they can also supply a DJ service for an additional fee. The full band comprises of a double bassist, drummer and keyboard player, plus three vocalists. To watch the Portobello's performance, visit their Function Junction band page. Chocolate Charlie are the wedding band veterans, where the 5 piece, female-fronted band first formed in 2003. They are an outstanding party band with an extensive playlist full of modern pop songs as well as disc, funk and rock hits from Daft Punk, Bruno Mars and Take That. Founding member and front woman Charlotte Hodson has performed with acts such as Texas, Kelly Clarkson and Chemical Brothers and in 2003 – 2004 she was a lead vocalist with Brit award winners Basement Jaxx on their Kish Kash Tour, with her vocals featuring on their 2005 single “You Don’t Know Me”. If you like your wedding band with an extra-hint of personality, DAMFINO will definitely catch your wedding guests attention with their steampunk inspired outfits and fun personas. DAMFINO have an eclectic repertoire of songs featuring ‘mashups’ of pop, rock, soul and hip hop tracks - Adele Vs the Eurythmics and Beastie Boys Vs Madness. Check out their full song and ‘mashup’ list on band their page for more information. Thank you again for making our day so enjoyable. You were all brilliant! The atmosphere was excellent. All our guests were on the dance floor from the moment you started until the last dance. You guys really know how to create a rocking atmosphere. The Hot Rox are a 4/5 piece wedding band made up of super-talented musicians who have performed and toured with artists and acts including Adele, Beverley Knight and Yoko Ono and also appeared on TV shows such as the X-Factor Live Finals (ITV1) and Jools Holland (BBC2). The Hot Rox cover a wide range of songs from top artists like Daft Punk, Katy Perry and Maroon 5, as well as oldies like Stevie Wonder, Marvin Gaye and Al Green. Check out their song list and also a live video for more details. We Three are a brilliant 3 piece wedding band from South Wales who specialise in indie rock and pop covers including hits from The Killers and Oasis, right through to present day tunes from Ed Sheeran and DNCE. We Three will make sure your whole day of entertainment is covered, where they can provide chilled acoustic music during a wedding ceremony or drinks reception and then play an energetic evening set for a reception, complete with a DJ playlist service too. What’s more, as We three are a trio they can fit perfectly into smaller wedding venues and may suit smaller wedding budgets as well.